No matter who performs it or how, vocal cord surgery used as behavior intervention exposes dogs and cats to lifelong misery or horrific death without any benefit, not even the claimed "secure home." Dogs and cats face serious risks, some life-threatening, without any benefit, not even the secure home falsely claimed by those with a financial interest in this elective surgery--including breeders. Devocalized animals are given to shelters and rescue groups or are convenience-euthanized for the same reasons as any other animal--or because the cost to treat complications of voice-altering surgery is prohibitive. They just suffer more. Is devocalization different than bark softening or voice reduction? Devocalization is the preferred lay term for surgically altering the vocal apparatus to change a dog's OR cat's voice. That's regardless of whether instruments are inserted through the open mouth (trivialized by those who support devocalization as "bark softening" or "voice reduction") or an incision in the neck. In order to alter the voice, vocal cord tissue must be cut. Even a small cut forms scars, and when that happens in the throat, it exposes the animal to lifelong misery or horrific death. Scroll down to learn more. The so-called "bark softening" or "voice reduction" approach carries an added risk: Because it often fails to achieve the desired vocal outcome, some animals are subjected to it--and the pain, stress and risks of surgery--repeatedly. What does a devocalized animal sound like? Vocal distinctions that communicate different meanings are removed or diminished. Many devocalized animals also gag frequently and/or suffer coughing fits the rest of their lives. CLICK to hear animals whose voices were "softened." Sadly, yes. Feline devocalization has been documented by those who have adopted these animals and by vets, including behaviorist Dr. Nicholas Dodman (author, The Cat Who Cried for Help). Click to learn why cats may vocalize persistently and how to resolve it without vocal cord surgery. How is voice-altering surgery done? The only way to alter an animal's voice is by cutting vocal cord tissue. That's done by inserting instruments through the open mouth (so-called "bark softening") or an incision in the neck. The veterinarian may use a scalpel, scissors, biopsy tools such as a punch forceps, or laser. The result is the same. Regardless of the surgical route, the instrument used or the vet's skill, cutting even a little vocal cord tissue exposes animals to serious surgical and long-term risks. Some are deadly. Others cause the animal a lifetime of misery. All voice-altering procedures pose serious surgical risks, such as blood loss, infection and adverse reaction to anesthesia. In fact, the risk of infection is greater for vocal cord surgery than other surgeries due to the resident bacteria in the larynx and trachea. Even a little scar tissue, a normal outcome of any surgery, can be deadly when it forms in the throat. What is the danger of scarring in the throat? When devocalized animals are sold or relinquished without disclosure, those who buy or adopt them--unaware their pet's swallowing and breathing could be impaired--may unwittingly cause the animal's death. Dry food can increase the likelihood of choking, and exercise that other animals of the same breed and age would tolerate may prove fatal for those whose breathing is compromised. The little Pom died in terror, gasping for air as he choked on his food after a vet "softened" his bark. What is the danger of damage to the larynx? Voice-altering surgery can result in permanent damage to the larynx, preventing it from closing properly. Animals may inhale food, liquid or vomit into their lungs; that in turn can lead to pneumonia. Does the veterinarian’s level of skill remove risks? No. Surgical risks and potential complications are present regardless of the vet’s skill and experience or the instrument used, including scalpel, scissors, punch forceps or laser. What about “notching” or "clipping" the vocal cords? Is that safe? These are just other words for "cutting." Vocal cord tissue must be cut in order to alter the voice, and there's no benign way to do that. Even a small cut bleeds and forms scars. Along with surgical risks such as infection, just a little scar tissue in the throat can have fatal results. Is recovery from voice-altering surgery painful? Although animals may be anesthetized during the procedure, anyone who has undergone surgery in the throat (or suffered strep!) can attest: Recovery is very painful. People can manage their own pain with medication or other palliative measures. But animals rely on the goodwill and responsibility of their owners. Not all dogs and cats receive proper post-operative care or pain relief. What about spay/neuter? Isn’t that an elective surgery too? Spay/neuter benefits animals by reducing the risk of certain cancers. Spay/neuter benefits society by reducing the pet overpopulation that burdens taxpayer-funded municipal resources and nonprofit animal shelters--and leads to euthanasia of countless healthy animals just for want of a home. Spay/neuter reduces excessive vocalization triggered by hormonally driven excitement or aggression. Why do animals vocalize persistently? Some people inadvertently teach animals to bark or meow persistently by rewarding the behavior. It's akin to giving a child candy to make him or her stop crying. While all dogs and cats are influenced by environment and training, some are bred to vocalize more than others. To select them as pets--or, worse, to breed them--only to cut their vocal cords is selfish, irresponsible and inhumane. Is devocalization/"bark softening" necessary to prevent euthanasia of a healthy but "talkative" dog or cat? That is an emotionally manipulative and hollow argument! No one is forced to cut healthy vocal cord tissue or kill a healthy animal for unwanted barking or meowing. And many shelters are now no-kill; all responsible shelters work with animals to resolve behavior issues. There are many effective, humane solutions, starting with responsible selection and care of a companion animal. Training consistently and correctly, and if necessary, medication to facilitate it, are other options. Shelter executives and concerned vets say rehoming is the kinder "final alternative." The real behavioral reasons pets are euthanized--biting and house-soiling--may be caused or worsened by devocalization. Surgically stifling an animal's voice allows the owner to ignore rather than address the reason for persistent vocalizing, such as loneliness or anxiety. The animal then may resort to other attention-seeking behaviors that are more irksome or dangerous than barking or meowing. Devocalization also can increase the risk of euthanasia when an owner is unable or unwilling to pay for very expensive surgery to remove post-devocalization scar tissue from the animal's airway. The rising cost of vet care in general is a leading reason more and more people are euthanizing their pets. Does devocalization keep animals out of shelters? Often, animals are given up when they're no longer useful for breeding or show--even after they've been devocalized. Who would have an animal devocalized and why? Is voice-altering surgery necessary for good relationships with neighbors? No; responsible animal stewardship is. Access to surgery, quick and easy for the owner, discourages the harder tasks of proper animal care, training and supervision--which are necessary to manage all behavior, including vocalization. Leaving animals alone in an apartment or outside for extended periods to bark their frustration and boredom is not responsible. Keeping groups of animals or those bred for frequent vocalization, such as herding dogs or Siamese cats, where their voices won't be tolerated is not responsible. Failing to spay/neuter--irresponsible on many levels--results in the hormonally driven excitement or aggression that is expressed vocally. Cutting vocal cords isn't the solution for these problems any more than amputation of a dog's or cat's legs would be for digging up the neighbor's garden or jumping on toddlers in the park. And vocal cord surgery is more lethal. Further, devocalization poses a danger to the community: It removes or diminishes the vocal distinctions that are animals' primary way to communicate with humans. Most people cannot read dog and cat body language, particularly when the animal is not their own. How many realize a wagging tail can mean agitation not friendiness, for example? A dog's muffled, ambiguous vocalization may increase the likelihood of an unknowing person being bitten--or cause harm to the animal when someone unfamiliar with him misinterprets his strange sounds. How many devocalized ("bark softened") animals are there? Many more than you think. Shelters and rescue organizations have documented receiving unwanted devocalized animals, and veterinarians have reported treating or euthanizing them for complications. However, this dirty little secret can’t be quantified. 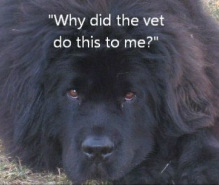 Those who have animals devocalized ("bark softened") and vets who perform it for them don't always disclose it. They know it's easy to hide. Unlike docked tails, cropped ears or declawed paws, cut vocal cords are not visible. And when devocalization is performed through the animal's open mouth, scars are internal--where they cause the greatest harm. They're hidden from view. Most people assume the dog or cat they hear rasping, wheezing, coughing and gagging has laryngitis or kennel cough. Few imagine the shocking reality: The animal’s vocal cords were cut just to stifle his or her voice.